Sarah Bernhardt is by far the best known and most loved peony in the world. In fact, it’s so popular it has become the flowery face of peonies in general. Sarah Bernhardt has the same pink colour as peach blossom, a colour that makes you feel like spring has sprung. For some, peony season only truly begins when this peony becomes available. Fortunately, we obtain Sarah Bernhardt from a lot of countries, so we carry this peony in our assortment almost all year round. Sarah Bernhardt is a full-petalled peony with large, pink flowers that bloom in late season and was bred in 1906 by French breeder Monsieur Lemoine. This variety is named after the famous French actress. Sarah Bernhardt usually has a bit of difficulty opening. 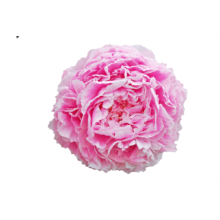 To avoid disappointment we advise you to buy this peony at the right stage of maturity. Does the bud feel soft when squeezing and do the outermost petals open up slightly? Then you can look forward to beautiful flowers with a vase life of about ten days. Have you nevertheless bought peonies that have difficulty opening? It can help to add a little sugar or 7Up to the water.